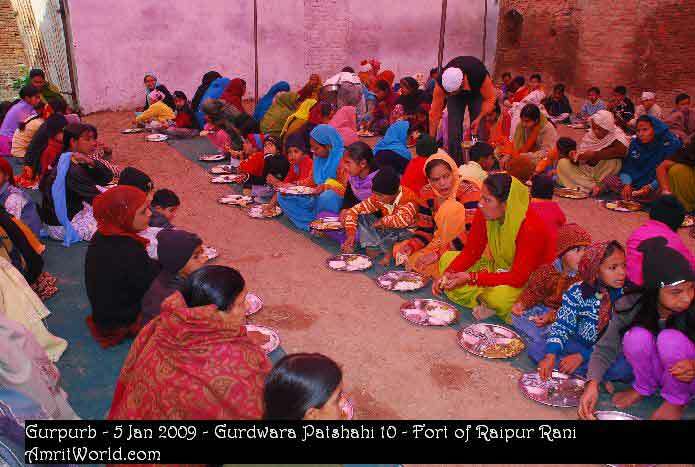 The ‘Prakash Purb’ (birth anniversary) of the tenth Guru, Sri Guru Gobind Singh Sahib Ji was celebrated with religious zeal and devotion in Gurdwara Patshahi 10, historic fort of Raipur Rani in Haryana state of India on January 5, 2009. Sri Guru Gobind Singh Ji himself visited this place after winning the battle of Bhangani in 1688. Devotees started to visit the historic Gurdwara Sahib in early morning. Present ‘Rao’, the descendant of the queen of Raipur Rani visited the Gurdwara Sahib on this occasion and bowed his head respectfully to the ‘Tharha Sahib’ (where Guru Gobind Singh once sat down) and Sri Guru Granth Sahib Ji. Members of Team Amrit World felt honoured to take part in Gurpurb celebrations. The ‘Bhog’ of ‘Sri Sahaj Path’ of Sri Guru Granth Sahib Ji was performed by S. Raghbir Singh (The Chandigarh State Co-operative Bank). During his address to the ‘Sangat’, Amrit Pal Singh ‘Amrit’ (www.AmritWorld.com) appealed the ‘Sangat’ to keep the historic place unchanged. He appealed the ‘Sangat’ and the Shiromani Gurdwara Prabandhak Committee to locate the historic weapons and ‘Pothis’ belonged to Gurus, which are now lost. A sword and a ‘Pothi’ were given to the queen by Guru Gobind Singh Ji, which are now lost. The ‘Ardas’ (prayer) was performed by Amrit Pal Singh ‘Amrit’. He then also read out the ‘Hukamnama’ of Sri Guru Granth Sahib Ji. Hundreds of devotees visited the historic Gurdwara Sahib on the day of Gurpurb. Many Hindu families paid respect to Guru Sahib during the Gurpurb celebrations. Local Sikhs made very good arrangements for ‘Guru Ka Langar’ (community kitchen, where free food is served). 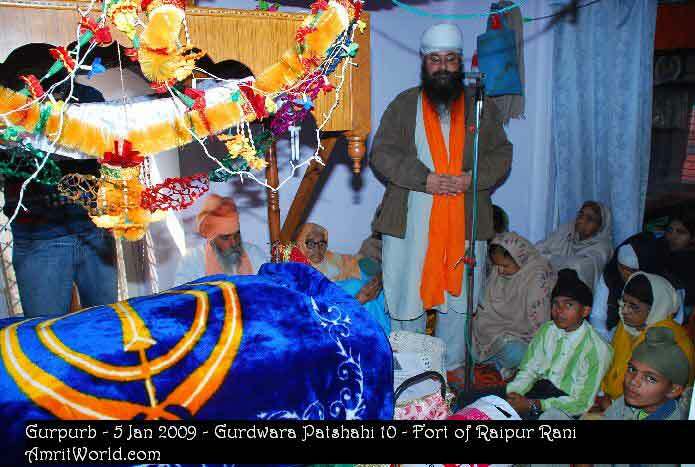 This entry was posted in Uncategorized and tagged Gurdwara, Official on January 7, 2009 by admin.